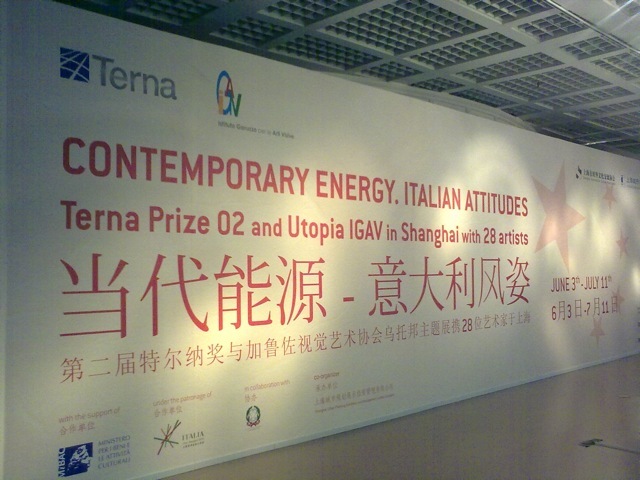 The Terna Prize 02 and the Garuzzo Visual Arts Association has arrived in Shanghai, and centering around the theme “Contemporary Energy” they exhibited the show Italian attitudes. Although the utopian theme initially appeared to be illusive under the careful deduction of 28 artists, it eventually managed to radiate a rational glow. The work which had the special honour of winning the Terna Prize 02 was that of Francesco Simeti. Simeti put deep thought into and conducted extensive exploration of the ideas expressed in the competition’s theme, “Energy: Mankind =Future:Environment — The proportion for new aesthetics”. His work, “Esercizio #2” (Exercise #2), took the form of a small visual encyclopedia collection that compiled various scenes. These scenes were extracted from developing China, and presented as triangular and quadrangular pictures. These pictures were all joined together harmoniously by dashed lines, which suggests that sustainable development is the only way to go in the relationship between mankind and nature. Riccardo Previdi, “Putlizer’s New York” , 2008. 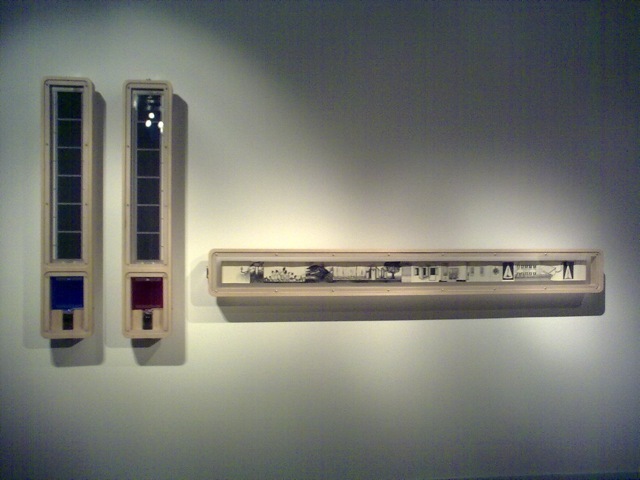 Wall-hanging installation, made from paper and plexiglass, 40X82x4cm. 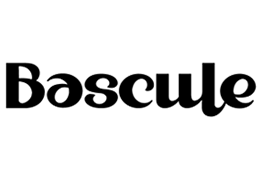 Courtesy of Galleria Francesca Minini. 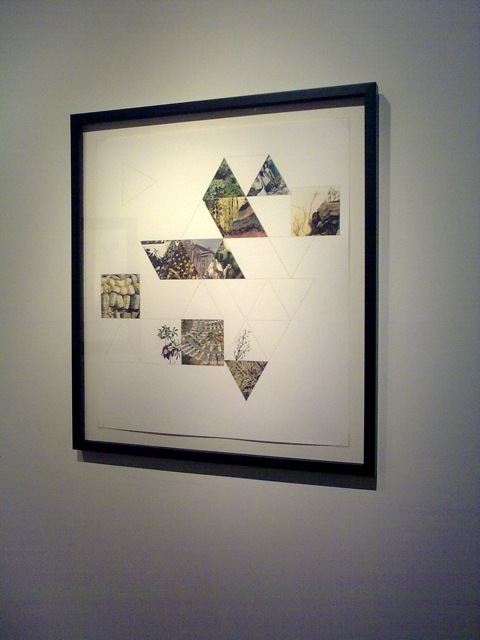 “Oversizing Acona Biconbi”, 2005, inkjet printing paper, 167x100cm, courtesy of Galleria Francesca Minini. Most of the pieces from the Courtesy Galleria Francesca Minini art gallery are also worth a look. One unique structure, resembling a child’s assembly set, evokes images of the futuristic architecture of a utopia. Through this piece, Riccardo Previdi has managed to express his views on development, architecture, and the art of the 1960s and 70s. Nicola Toffolini, “Volumi mutevoli a regime di crescita disturbato”(The volume changes according to the growth of disturbance), 2009, various materials, 30x160x10cm/ selected from notebook related to exhibit: Volume corresponds to controlled growth and changes 2009, black handdrawn sketch, colour type: 0.05 and 0.1., Moleskine notebook , 14.8 x 18cm. On the topic of wall installation art, one cannot ignore Nicola Toffolini’s “Crop Cultivation Cells”. The work consists of two crop cultivation cells, simultaneously displayed, which have self-sustaining energy sources. The energy that recharges the boxes comes from an external, man-made source and is absorbed by a solar panel that transforms it into a beam that can be directly absorbed by the plants. The light spectrum that is formed (one box is blue and the other, red), through distortion, affects the growth of the two sets of plants growing in different environments. The installation thus builds an authentic relationship between nature and cultivation. Despite being miles away, the Italian artists were heavily influenced by traditional Chinese culture while working on their pieces. 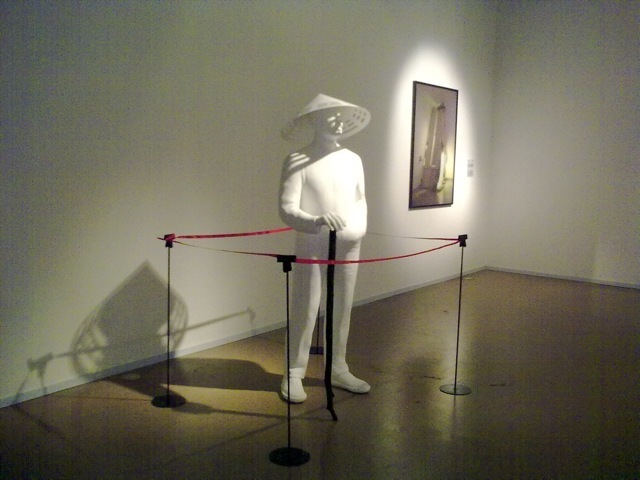 One of them was Saverio Todaro, whose work consisting of a model of a traveller wearing a douli (Chinese bamboo hat) expresses his philosophy on life. “Foreign lands and partings are a wanderer’s destiny. Wanderers have no fixed address, and the road is their hometown. Because of that, they need to cultivate themselves, to be upright and wise, to rest only at suitable places, to go around only with good people. 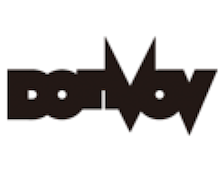 Hence, they are healthy and fit, and can go along on their journeys without any hindrances”. The installation is dedicated to Chinese philosophical masterpiece, the I-ching—a work that dates back a millennium, the I-ching has, until the arrival of modern biological science, been fundamentally threatening Western scientific principles which are based on causal relationships. Although the West has tried numerous times to understand the culture of the oracle bones, they have always done so using their own modes of thinking and logic. The I-ching, however, is ironically the only form of “possible” utopia, and is based on principles of coincidence, moment theory, therefore being the only model that can affirm our existence. 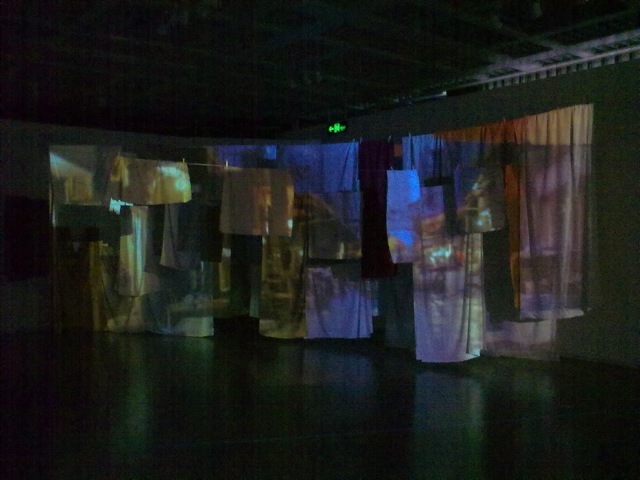 A second section in the exhibition area clearly has film pieces as its centre. The moment you walk in, you hear the crisp sound of dripping water. 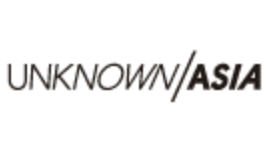 It turns out to be artist Andrea Aquilanti’s audio-visual installation, which also happens to be this competition round’s second prize winner. 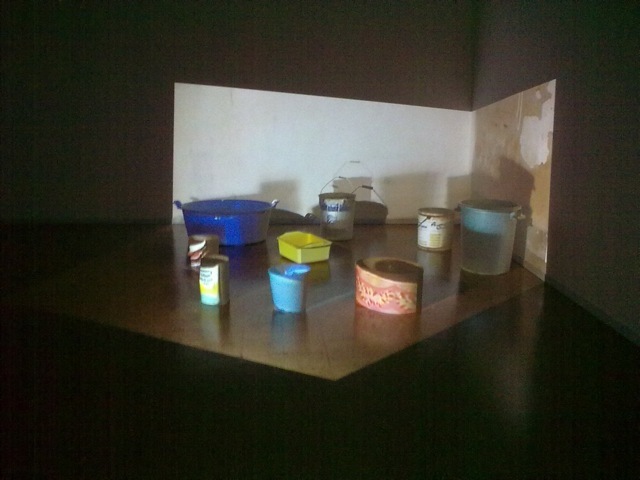 The work simulates a leaking roof in a room. The water does not fall to the ground, but into nine containers that stand on the floorboards. The falling drops of water make ripples on the surface of the near-overflowing water. The environment is half lighted, half dark; only the space where the containers are places is illuminated by a beam of light. If you intruded in between the light source and the containers, the containers would lose their colour, as though they had faded with time. The work can be interpreted in many layers, one of them a call for people to reuse natural resources with the help of simple tools, such as by collecting water. In another corner, clothing, rags and bed sheets—ordinary everyday items—were hung high up. Artist Filippo Centenari has recorded images of a city’s stable, majestic buildings and projected them on top of these daily, ever-changing, unstable ordinary items. Eternity and the declining come face to face with each other, and the world, through this design, becomes more human, its beauty manifested in the household. 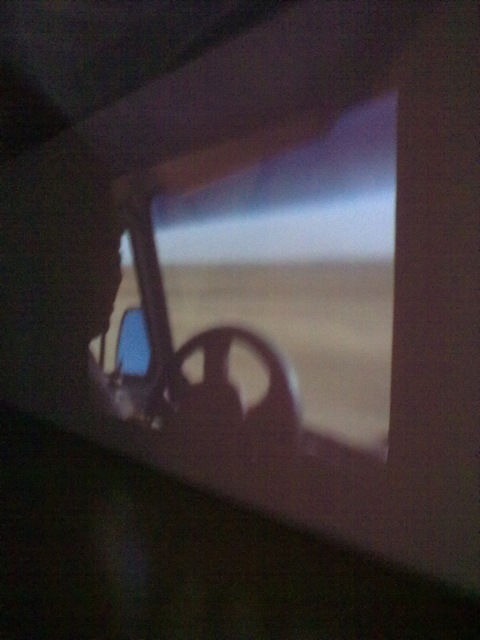 Besides that, there was another piece in the exhibition that took the form of a continuous film projection. “A Water Tale” is a short film filmed at an Arab lake in Kazakhstan, and was an entry in the United Nations-supported “Stories on Human Rights” film festival. Short yet exquisite, it is a recount of one of the most tragic human disasters, of how a gigantic saltwater lake that supported tens of millions of lives nearly dried up under Soviet administration in the 1950s. 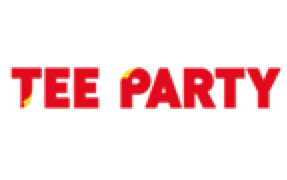 What is particularly meaningful is how the film clearly and unpretentiously shows the courage and determination of the people who persisted in staying in that area, and how they did not bow down in the face of the threat of destruction of their roots and culture, but instead, in both joy and sorrow, continued to believe in this rational utopia. 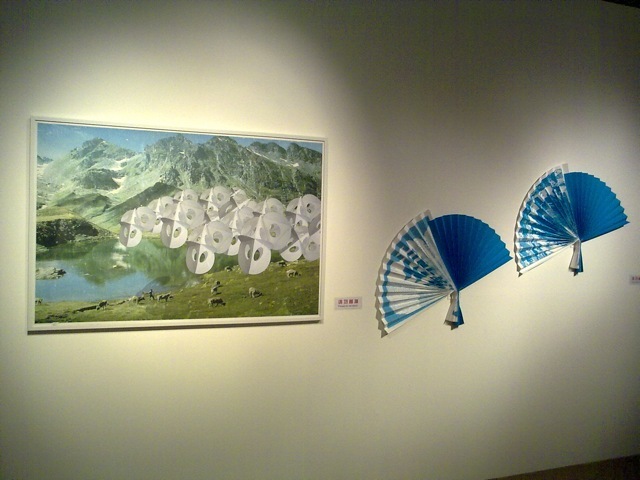 In this exhibition, not only were we exposed to works that were enriching and full of variety in both expression and technique, we were also, through the theme of the exhibition as well as through the artists’ inspirations for their works, made to think about the relationship between the mankind’s future and environmental protection. Even as we advocate “environment protection” in all sorts of ways, we need to quietly reflect about the resource crisis we are facing, instead of simply making empty talk about “low carbon lifestyles”.